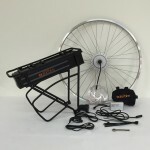 We stock, sell online and assemble the complete range of SOLAR BIKE electric conversion kits. Click on the images below for information on our most popular kits, call us for information on other kits. 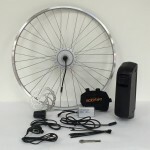 Kits are available in a variety of rim sizes, motor powers and battery capacities. 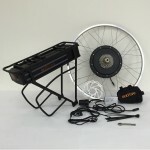 You can see the complete range of kits available from SOLAR BIKE here. 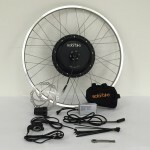 Kits are available in 20″, 24″, 26″, 27.5″ and 700c rims. 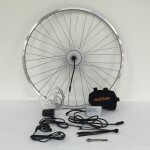 They come with Alex DH19 rims, stainless steel spokes, controller, twist throttle, thumb throttle, controller bag, torque bar, disc, cable ties and a few other bits and pieces to make assembly easy. 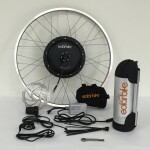 Converting your existing bicycle to electric or purposely choosing a bicycle to convert is perhaps the best way to get a high performance electric bicycle suited to your needs. 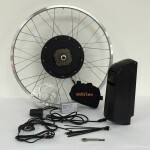 We stock and use the SOLAR BIKE conversion kits, they have a fantastic range of kits available using Panasonic batteries of various capacities and they also provide a range of motor powers and rim sizes. Keep in mind that 200W is the legal limit on Australian roads, anything over this power level needs to be an off road bicycle only. Front hub motor kits are available in rim sizes of 20″, 24″, 26″ and 700c. 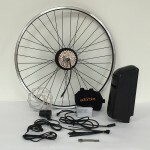 If you have a bicycle that you’d like converted then please bring it in and we can do the assembly work, we have converted hundreds of electric bicycles in our time and we know exactly what is suitable and what isn’t. Mid drives are an alternative to the traditional hub motor. 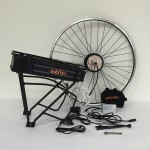 We have a range of conversion kits that use centre driven systems. 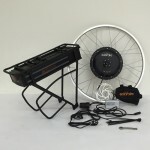 We stock and install the 250W, 350W, 750W and the new and powerful 1000W 8fun mid-drive kits. The kit alone is $690 for 250W, 350W and 750W and the new 1000W one is $990. You’ll need a battery also. The 250W and 350W can use any 36V battery whilst the 750W and 1000W ones use a 48V battery. 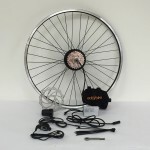 These kits run through the chain drive of your bicycle. Assembly is a little trickier as you need to replace the bottom bracket but they are a lovely system. 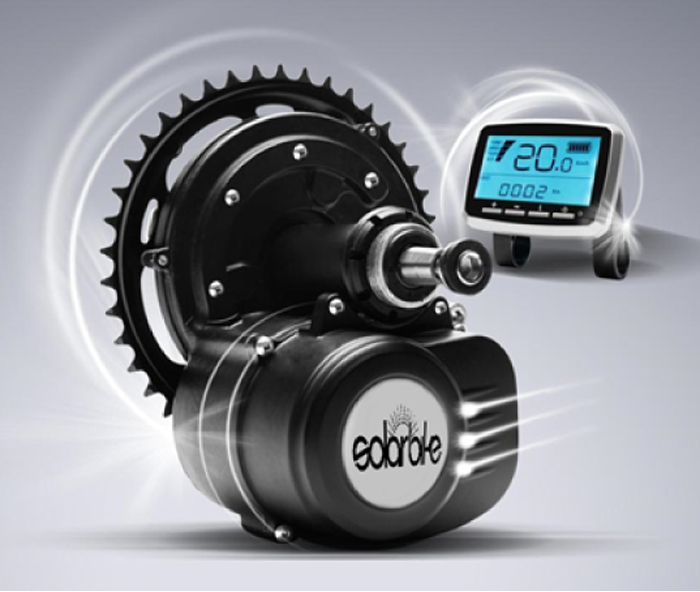 Extremely quiet and efficient and capable of very high speeds depending on the gearing of your bicycle. 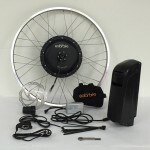 This is our own mid-drive motor electric bike conversion kit that can be run at powers of between 250 – 350 Watts and use any of our 36V battery options. The power level can be modified through the LCD settings. Keep in mind that 250W is the legal limit for the road. This kit mounts in the crank and is one of only a few mid-drive conversion kits that has torque sensing. The kit can sense the pressure you apply on the pedals and this results in a smoother ride than using traditional cadence sensing. It’s rather similar to the BOSCH or SHIMANO production line ebikes with the mid-drive motor. You must remove your existing bottom bracket and replace it with the 4.3 kg motor. It comes with both throttle and pedal assist using an integrated speed sensor. 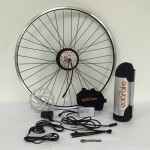 This kit is compatible with standard bikes with a 68-73mm bottom bracket. 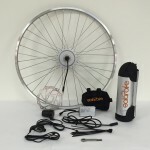 It’s a great kit to use and it enables you to run with all of your rear gears. It took a long time to find and improve upon a reliable torque sensing mid-drive kit but we’re happy to be able to provide this one to the market. Please click here to see the installation manual.